The Washington Redskins defense was among the most porous in the NFL last season. And while the team is still more than a month from putting this year's version to a real test under new defensive coordinator Joe Barry, the players are eager for the challenge. Almost to a man, they expect an influx of new talent and Barry's energetic style to make the improvement real. “He's very energetic. You can tell. 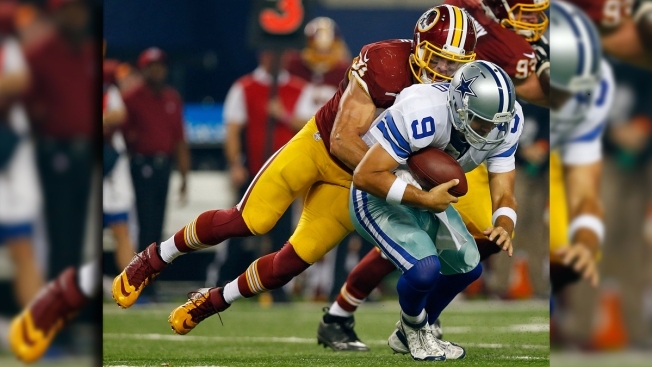 The guy just loves football,” linebacker Ryan Kerrigan said Monday. “He's so passionate in every meeting, from the first meeting in OTA's to today, he's had the same amount of energy and that consistency I think is a good thing. That fire is no doubt fueled in part by what the Redskins did last season under Jim Haslett. They allowed 27.4 points and 357 yards per game in 2014, when they finished 4-12. They gave up 35 touchdown passes, but managed just seven interceptions. Since last December, they signed Terrance Knighton, Stephen Paea and Ricky Jean Francois to shore up the defensive front, and Knighton and Paea already are penciled in as starters alongside holdover Jason Hatcher. Barry's coaching style has made adapting to what he wants easy, Francois said. “He teaches us everything that we need to do. He takes everything serious. He gets on us but at the same time, he's a cool cat outside of that. He knows when to be friends and when to be that coach, and the majority of time, he's that coach,” he said. Less than two weeks into training camp, the Redskins still have a long way to go to get their communications down, and head coach Jay Gruden said a slew of injuries that have sidelined most frontline members of the secondary at various times have slowed that process. Still, Gruden is confident the unit will be ready when Washington opens at home against Miami on Sept. 13. In the secondary, one of the walking wounded is cornerback DeAngelo Hall. The veteran entering his 13th season is working his way back from Achilles surgery that caused him to miss 13 games last season. He's enjoyed watching Barry's passionate approach to the game. Hall has been limited in training camp as he works his way back from the injury, but he said he expects to be in the lineup with the starters for however long they play in Thursday night preseason opener at Cleveland. Notes: Players being evaluated for injuries after practice Monday included LB Will Compton (groin), LB Keenan Robinson (head; precautionary), RG Brandon Scherff (right ankle) and TE Niles Paul (left shoulder). ... The Redskins' game notes include a depth chart that Gruden said he'd rather have saved until the opening week of the season. He said competition continues for most jobs.